On 8/24/17, the Route 66 Corridor Preservation Program, which is administered by the National Park Service, National Trails Intermountain Region, notified the Tropics Neon Sign Project Committee it had been awarded a $17,000 grant. 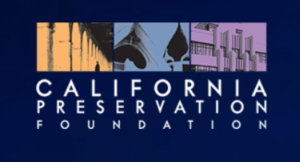 The cost-share grant program provides grant assistance for eligible historic preservation, research, oral history, interpretative, and educational projects. Grants are offered through an annual, competitive grant cycle. Since 2001, 139 projects have been awarded $2.1 million with $3.4 million in cost-share match, totaling $5.5 million in public-private investment toward the revitalization of the Route 66 corridor. 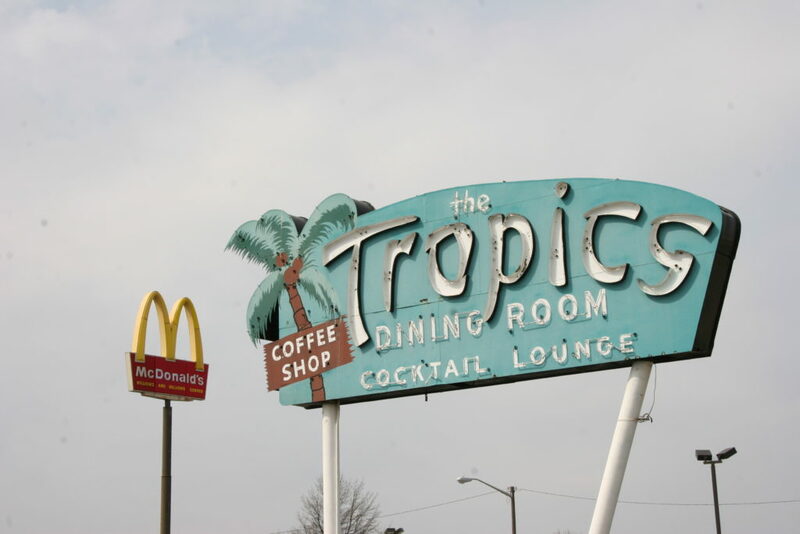 The Tropics restaurant was opened in 1950 by Vince Schwenoha in Lincoln, Illinois. Vince served in Hawaii during his WWII tour of duty, which was the inspiration for the name of his new business. The site included a large, signature neon sign that quickly became the symbol of the restaurant and a Route 66 landmark. In 1955 Lew Johnson became manager of the Tropics. Under the leadership of Lew and his wife, Bev, it operated successfully as a family- run business for the next five decades, attracting customers from far and wide. In 2016, the Tropics was inducted into the Route 66 Association of Illinois Hall of Fame. After sitting vacant for ten years, the property was purchased for the construction of a new McDonalds restaurant. While the building could not be saved, a public/private partnership was put in place between the City of Lincoln, the Logan County Tourism Bureau, and the Johnson Family to preserve and restore the iconic Tropics neon sign. Thanks to the NPS grant and other funds raised to date, the Tropics sign will be restored to operating condition to honor the history of this well known Rt. 66 restaurant. Included in the project design is an interpretive panel that will tell the story of the Tropics so visitors can learn about the history of the restaurant, its relationship to Route 66, and the long-time involvement of the Johnson family. In addition to preserving an important piece of Lincoln and Logan County’s Rt. 66 history, the restored Tropics sign will be used to promote and market other Rt. 66 related attractions in Lincoln. To date, approximately $60,000 of the total $70,000 needed to complete the Tropics neon sign project has been raised. The opportunity is still available for donors wishing to contribute to the project. “TLC Champion” donors, [$1,000 or more] will be recognized on the interpretive panel installed by the restored Tropics sign. “TLC Partner” donors [$500 or more donation] will be recognized on pavers placed around the base of the sign. “TLC Benefactor” donors [$250 or more donation] will be recognized via a brick installed at the base of the sign. Donation information is available from the Logan County Tourism Bureau, 217-732-8687. You can bet that we’re already planning Motor Tour 2018! Watch here for updates as details are confirmed and the dates draw nearer. 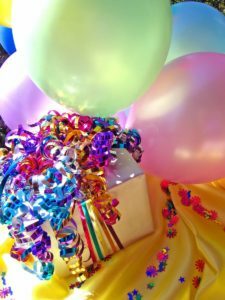 Hall of Famer Jubelt’s Turns 95! 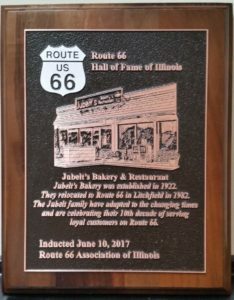 We’d like to extend our congratulations to Jubelt’s Bakery and Restaurant in Lichfield, Illinois on an auspicious occasion. The business is celebrating turning 95 this weekend! Route 66 News posted a great story about the business’ history and planned festivities. Read our account of the business upon becoming a 2017 inductee to our Association’s Hall of Fame. Wilmington’s Launching Pad Has New Owners! Tully Garrett and Holly Barker have officially purchased the Gemini Giant/Launching Pad as of October 17, 2017. 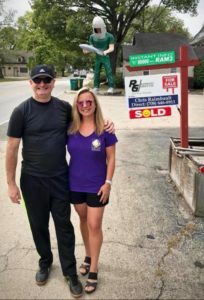 The famous muffler man statue and drive-in restaurant will remain at their original location at 810 East Baltimore Street (Route 66) in Wilmington, Illinois. They will be introduced by Cory Jobe, Director at Illinois Office of Tourism, after his keynote address that kicks off the Route 66 Miles of Possibility Conference in Joliet. Jobe’s address is at 9am on Friday, October 20th, followed at 9:30am by a press conference with owners Tully Garrett and Holly Barker. An official from the City of Wilmington will also be on-hand. The restaurant dates to 1960 under the original name of Dairy Delite, and in 1965 was renamed Launching Pad, becoming home to the Gemini Giant, a fiberglass “Muffler Man” sporting a space helmet and rocket ship. It is a remnant of our fascination with space travel in the 1960s. New owners Tully Garrett and Holly Barker describe themselves as “second-chance soulmates.” They both lost their spouses to cancer in the last several years. “We were both living the American dream and we both had our lives crash in on us due to the loss of our spouses,” said Barker. According to Barker, Garrett owns an insurance agency that has been in his family for 55 years. Tully was also in the music industry, and his extensive music memorabilia collection will be on display at the Launching Pad in a mini-museum. Tully has a real affinity to classic cars and car shows and he plans on hosting car shows at the Launching Pad and wants to partner with local business owners to help bring in the community to make this a huge success. Barker started working in restaurants the day she turned 16 and continued to work through high school to afford a trip to England and thus her love for travel adventure was born. She is “so excited to embrace the travel and tourism industry here in Illinois.” Holly describes herself as a world traveler having lived in three different countries and travelled extensively. Barker has worked at a broad spectrum of restaurants, including a BBQ restaurant in North Carolina where she is from, all the way to fine dining establishments. She earned a minor in Food Service Management with a BS degree in Health Promotion from Appalachian State University in Boone, NC. Her first job out of college was working for PYA Monarch Food Service Distribution which later became US Food Service. She left the food service industry in 1998 to join the pharmaceutical industry where she worked for Abbott Laboratories with its home base close to Chicago. With the Grief Resource Network, Holly plans on bringing her skills to the Launching Pad and helping with the homeless crisis in Chicago, utilizing the food trucks and a percentage of the restaurant’s profits to aid in her cause to feed the hungry. The organization will house itself in the back of the Launching Pad. The front of the building will provide “the full experience of historical nostalgia and the great food and experience everyone is hoping for,” said Barker. “The restoration of the Launching Pad to its original glory and intent is paramount, with the added new benefits of our community projects. We will be starting renovations on the exterior of the building and then moving in phases on the inside of the building during the winter months. We hope to be ready by late spring of 2018.” However, Garrett explained that they bought the building “as is” and do not have knowledge yet of the extensive repairs that are needed due to the building staying vacant for five years. “What is there now is ‘pot luck’ as to what works and what doesn’t in terms of the kitchen equipment, freezers, HVAC, and electrical so to project what we can do and when can do it will be better described as we know what we have to repair. We will build our cash flow through food trucks and merchandise sales that will then be reinvested into the renovations. To register for the Route 66 Miles of Possibility Conference, please visit route66milesofpossibility.com. For more information on the Gemini Giant/Launching Pad, visit www.facebook.com/thelaunchingpadroute66. This past weekend was the Mother Road Car Show in Springfield, Illinois. I spent two days in the 92 degree heat with Board Members Marty Blitstein and John Lucchesi. We talked Route 66 with actual travelers who stopped at our booth on their way west, spoke with dreamers who talked about how someday they will travel, and others who just love the road and everything about it. Even Governor Bruce Rauner rode his motorcycle on Route 66 Saturday in the heat, stopping to visit some of the 66 communities and ending at the Illinois Scenic Byway sponsored Travel and Leisure Expo on Washington Street. Not only did “Bruce” take the time to sign the Event car hood, he stopped to speak to all manning the tents and booths and shook our hands, thanking us for being there and all we do for the 66 community. In a world where so much is going on and you worry about whether or not the Route 66 community is being heard, it gave me hope. Hope that we can keep our vision of having Route 66 a national trail so when the old timers who were present at the festival are long gone, the two lane will be honored and remembered as she should be. Route 66 is very much an issue on the local (Illinois) scene as well as the national. There is renewed energy about preserving the road and acknowledgement that we have National treasures in each state that need to be attended to. 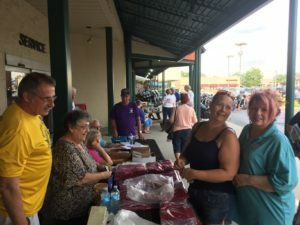 I have been outspoken about my biggest fear that Route 66 becomes a money based 2600+ mile “Branson on steroids.” This past weekend I was able to talk with many of the people and community members who are working hard to make sure that our 66 history – service businesses, mining, farming, etc. is not lost to time. I spent time with a family traveling the road from Australia that had an autistic child that was having an amazing time and according to his parents was being more expressive than usual because everything they watched on video was just as it appeared. Even the intense heat he found fascinating. We learn something from everyone we meet on the highway. Our Association is having their annual elections on Sunday, October 15th, at the Pontiac City Hall Annex, 115 W. Howard Street, in Pontiac. The Board meeting is at 10 a.m. and we break at Noon for lunch. The General Session/elections Starts at 1 p.m. This year the positions up for election are President, Recording Secretary, the Corresponding Secretary, plus the county representatives from Cook County, Grundy County, Logan County, Madison County, Sangamon County, St. Clair County, Will County, and one at large position. We hold four meetings a year – one in January, one in April, one in July, and one in October. We ask board members to keep our group aware of what is happening in their County, to watch to make sure the road signs are where they should be, and to donate at least two Saturdays a year at our museum in Pontiac. All board members are asked to participate in the planning of the annual Motor Tour. If you’ve always wanted to get involved, now is the time. We, as a group, have discussed ending the tours in 2019 – because after 28 years the tours are are harder to plan as the economy tightens and people and communities have less to share. Volunteers are the heart of our group and of the communities we represent. So this winter when you’re cleaning the house and garage, finding those treasures you bought at sales along the road, keep in mind that starting in April, Litchfield will continue to have their 2nd Sunday Market – selling anything from 1980 and before. Bloomington has their 3rd Sunday at the Interstate Center. The Red Carpet Corridor is the first full weekend in May – the 2018 date is May 5th and 6th. 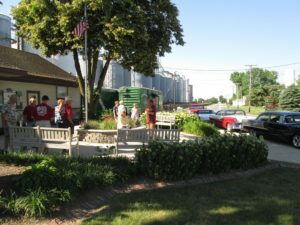 The 29th Annual Motor Tour will be June 8th, 9th, and 10th! July brings local festivals and events all over the state! It’s time to plan a little time out now for the coming year – to see all the new exciting things that will be happening along our Illinois miles. Our Illinois greens are giving way to the golds and reds of fall. Time for holidays and school events and family celebrations. In the real busyness of every day life, take time to reflect and think of your own history. Share this with your family. Put down the cell phones, the tablets, the cable/DVR will hold whatever is so important for a while so you can share and talk. Someone in Springfield asked me what one man could do for the Association. I told them about how Tom Perkins and John Weiss were working on a memorial to the late, great, Riviera restaurant in Gardner. I explained how the men worked on setting it up, changed things, tried to find the best way to have some kind of marker for a place that had been a manmade entertainment center. It originally had a rock garden, at one time a petting zoo. It consisted of an old church and a house – and it flooded so many times – but it came back and served the people time after time. One day John Weiss was there when they delivered a couple tons of gravel – crushed rock – to be distributed around the new sign. John Weiss didn’t leave the stone mound there. He distributed it shovel full by shovel full until it was done. John could have called up the Preservation Committee and asked for help but it was something he felt he could do. A tribute to the Krafts, Peg and Bob, and the stories and service they provided for years at the Riviera. 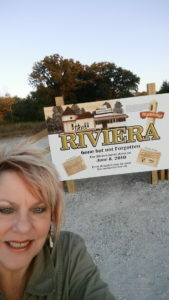 I’ve used the photo of me at the new sign, my first ever “selfie” to show our new attraction. Kudos to Tom Perkins, John Weiss, and the artwork of the “Con Man” for their hard work. We are blessed for having people all up and down the road working – Dave Tucker in Gillespie working on the Mining Museum, Nelson Gorman in Mt. Olive working on multiple museums, the late Sam Reichert Jr. for his “Just Off 66.” We had the priviledge of working with the owners of DeCamp Junction, Loren Kovaly and his partners who just sold DeCamp. Loren brought water in not only to DeCamp to save it but provided water access to his neighbor as well. In this Loren made sure that DeCamp was not another historic building lost to time…another empty building on the side of the road. I understand that every time you try to thank someone it seems like you forgot someone else and there are hurt feelings. There are just so many people to thank over the course of years I have been President that I would have a double issue of just “thank yous.” I have learned perseverance, patience, how to lose with grace, how to compromise, and how to help history speak. Money is a great help, but volunteering is priceless. Thank you to everyone who ever gave me a minute, an hour, or years of service. Thank you to the city of Pontiac for their can-do spirit. Thanks to Bill Kelly and Geoff Ladd for their making the Scenic Byway in Illinois a positive force in our communities. Thank you to Martha Jackson in Litchfield who proves you can do anything you set your mind to – and the Route 66 Welcoming Center and Museum in Litchfield is proof of that. I have learned so much and have so much more to learn and do. Before the snow flies, get that last piece of pie at the Palms Café. Enjoy the Chicken at the Old Family 66 Restaurant in Dwight. Time to sing karaoke at The Luna in Mitchell. Don’t forget our newest Illinois museum, the Mill. Only took 13+ years to open but I do believe the 66 spirit is patient. Enjoy the fall, and thank you all for your support of the Illinois Route 66. 2017 Route 66 Association of Illinois Membership Special! Marty’s having another birthday (special)! Between September 1 – December 31, 2017, buy a 12-month membership in the Route 66 Association of Illinois membership, get it extended to 18 months! This offer is available to first-time members and those whose memberships have lapsed more than two years. Click here to learn about our membership levels, then choose the one that suits you best. You can join by mail or online – you don’t need to have a PayPal account to have your credit card processed through the PayPal link. We know that once you experience the satisfaction of being a member of our Association, that 18 months will be only the start of your support of our efforts to preserve, educate, promote and enjoy Route 66 in Illinois. We look forward to welcoming you among the members of our fine, dedicated group! Join us today and we’ll get your welcome packet in the mail soon.